Trump financial forms filed: Noted intellectual can now debate less popular Republican candidates. 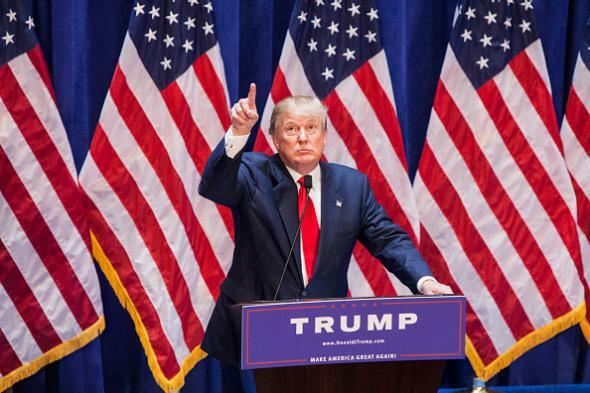 Donald Trump announces his presidential candidacy at Trump Tower on June 16. News emerged last week that Fox News would allow only individuals who had filed Federal Election Commission financial disclosure forms to take part in the first Republican presidential debate on Aug. 6, a rule suspected of being an excuse to keep Donald Trump from embarrassing the GOP by participating. The theory went that that Trump—who is the leading 2016 Republican presidential candidate, according to the Suffolk University/USA Today poll, and is also suing Univision for $500 million in a dispute involving a beauty pageant—does not ultimately believe he can actually win the Republican nomination and thus would not be willing to reveal personal information in order to continue his campaign. No dice, Republican establishment! Mr. Trump, who once appeared on a “reality TV” program called The Celebrity Apprentice with Khloe Kardashian and Dennis Rodman, will see you in August. Future President Donald Trump’s businesses have filed for bankruptcy protection four times. Other individuals who have appeared on The Celebrity Apprentice include Jose Canseco and Sinbad.